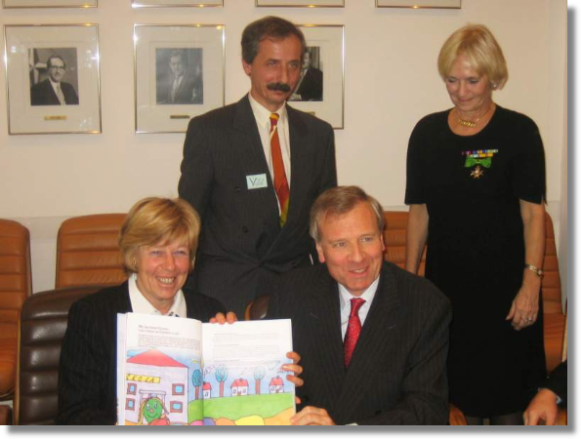 On Sunday, December 4, 2005 the delegation of the Czech Centipede children flew to Brussels to introduce to the Secretary General of NATO Mr. Jaap de Hoop Scheffer the book „Flying together only to war“. Mrs. Bìla, Mr. Prochazka, major Mrs. Cvanova, Dr. Hodkova and Mrs. Vavrova accompanied the children. On Monday the delegation was received in the NATO headquarters. Mr. Scheffer and his wife warmly welcomed whole delegation. Mrs. Bela informed them about the Centipede movement and together with Mr. Procházka they handed over the English version of the book. Among the presents that the children brought to the Secretary General and his wife there were special Christmas cards, made especially for NATO. Especially Mrs. Scheffer liked them very much. At the end of the meeting, Secretary General and his wife accepted the patronage over the movement “On Own Feet” and promised to visit some of the Centipede schools in near future. H.E. Mr. Eide, who visited Kosovo several times himself, appreciated Centipede’s help to their friends very much. Everybody could feel from his words how deeply he is touched by the destinies of the children in the affected areas and how glad he is that Centipede helps them.